On word of Fred's passing there was an outpouring of condolence messages to the family from around the world . View the sympathy notes Fred was a fixture most evenings on the Sanderson Hour which meets on 3762.5 khz . A poem from an earlier tribute to Fred was modified for the occasion. Fred died peacefully at St. Joseph's Hospital in Guelph on Sunday November 7, 1999 after a long illness. His cheerfulness and generosity will be missed by his family, friends and employees of Hammond Manufacturing. For over 60 years Fred helped to build Hammond Manufacturing with his brothers Len, Roy and Ken into one of Canada's oldest and largest electrical and electronic equipment manufacturer. An amateur for more than 70 years, Fred started building radios in 1923 and became a Radio Amateur in 1929. 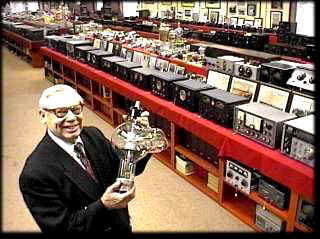 He was elevated to the Canadian Amateur Radio Hall of Fame in 1996 and -- among other accolades -- had been named Canadian Radio Amateur of the Year and was recently honoured by the Quarter Century Wireless Association for his 70 years . His contributions to Amateur Radio and Amateur Radio causes are legendary. Fred and his long time friend Tom Wong VE7BC were responsible bringing China back on the air in 1983 with BY1PK. Fred was a founding member and past President of The Southern Ontario Chapter 73 of the Quarter Century Wireless Association. Through his leadership he built the local chapter to the largest chapter in the association. Funeral Services were held Thursday November the 11th from the Harcourt Memorial United Church in Guelph where a celebration of Fred's life was eulogized by Martin Rosenthal VE3MR and Fred's two sons Bill and Rob VE3EIL. Many friends from around the world paid tribute to Fred at the Hammond Museum of Radio Guest book.